Would this Gametype be allowed in the new Contest? Discussion in 'Mapping Questions & Discussion' started by SeanMcPhearless, Sep 25, 2015. My concept isn't too complex and is very possible that it had already been thought up before. Basically its a 3 CP game where it does not take long to capture a point, but the last point for each team you have to hold for 5:00 minutes in order to win. So it's like a Tug-of-War CP map sorta? Sounds like a cross between regular Control Points and King of the Hill. Also your diagram is a little confusing, at first I thought that was the entire CP layout. It sounds like KOTH but you have to cap two points and suffer through a longer timer for some reason. Arena and King of the Hill maps are NOT allowed. The rules are that you cannot have a KotH gamemode, I was just unsure if my gamemode was too similar or not. Oh! Sorry about putting it together abruptly. The first set of 3 points starting at the top is what the game mode looks like at the very start. The control points under are what the map looks like based on which team made a good enough push. The time I set forth is relative. The idea is just that you have to hold the final capture point for some time to win. Respawn timers would be screwy to work with for a concept like that. I messaged Berry with a question about "dynamic" aspects. Ask if it'd count as CP for your concept. I believe it'd be really confusing for players to cap the final point in a symmetrical map only for them not to win. It'd be pretty hard to explain what the players need to do at that point without just writing it out in game and hoping someone reads it. You have a good point here, However, the layout I have set up for my map is really condensed. 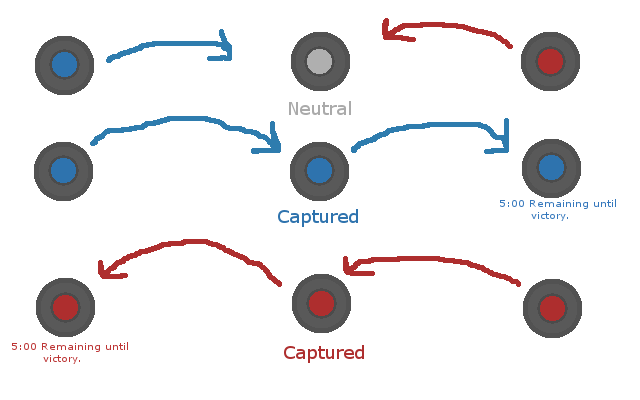 The final capture points for both teams are pretty close to each other. 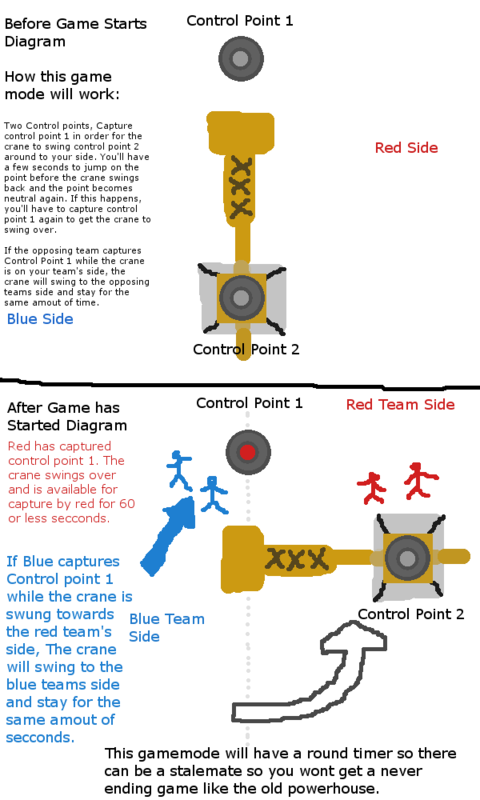 I don't know if this would change things or make the timed final capture point less unfair though. I've actually tried something similar to this before. My layout was bad, but the gamemode design is also unintuitive to the players. As tyler said, capping the last point is messy because players will get confused about the win condition. "Hey we own all 3 control points? where is the win", and only after taking and subsequently losing the point will they understand the timer. I also may not be fully understanding what you are trying to do. I'd be interested to see what the hud/layout would look like, and if the timer doesn't refresh or whatever you choose. However, I'd view this as cp with a twist. Might not necessarily be "dynamic" though. Thank you for your feedback! I definitely understand why it would be unintuitive to have a timer on the last control point. I was thinking, what if I put the timer on the center capture point instead? would that be way too similar to KotH just with a random final cap? I decided that I'm not going to risk anything having a gamemode so similar to KotH and being an unintuitive gamemode at that. So I created an all new gamemode that I know will be allowed for the Contest. That could be solved by putting the final point on a slow elevator or something. But isn't a large moving crane dynamic? Also the theme and size of my map might not have room for an elevator. That looks like a nice gamemode. I'd be up for helping you do the entity work if you need it. That would be terrific! I'd love to have your assistance. I posted that at the same time you posted the crane idea, so it doesn't take that into account. The crane idea is interesting too. Oh! My apologies, I was oblivious.